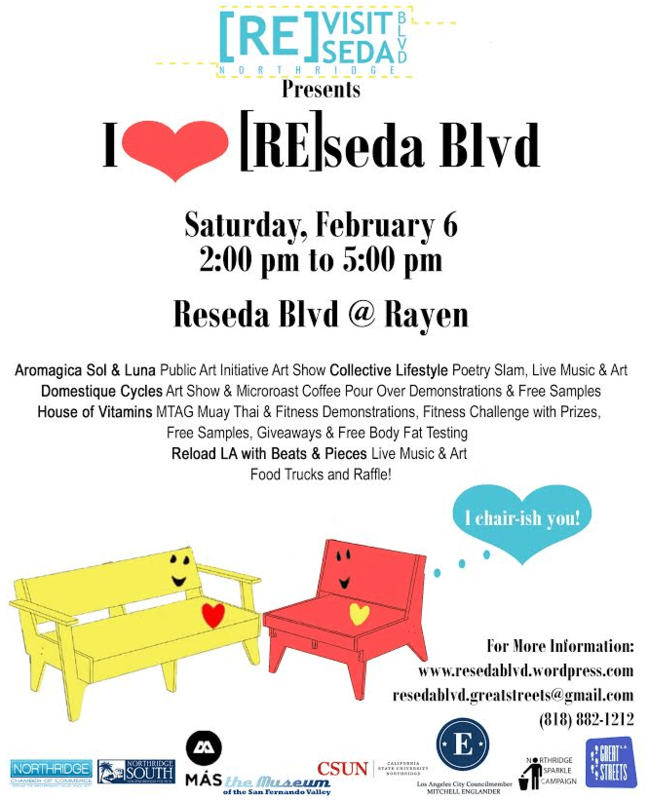 I Heart Reseda Boulevard takes place tomorrow! Other Great Streets challenge grant activities happen later this month and next. In 2015, Los Angeles Mayor Eric Garcetti’s Great Streets Challenge Grants received 30 applications from interested groups. Eight grant winners were announced in July. The grants go to community organizations to host temporary “pop-up” projects that help neighborhoods re-envision what their streets can be. Since July, challenge grant awardees raised additional funds, which were matched by further city funding. Now comes the season to enjoy the pop-up projects. A couple of challenge grant events have already happened, but most will get into full swing in February and March. [Re]Visit [Re]seda – on Reseda Boulevard in Northridge – hosted by The Museum of the San Fernando Valley with CD12, CSUN Urban Planning, Northridge Sparkle, Northridge South Neighborhood Council, LA-Más, and the Northridge Chamber of Commerce. Tomorrow, enjoy poetry, coffee, fitness challenges, live music, and plenty of food choices as the I <3 Reseda festival takes place from 2 to 5 p.m. on both sides of Reseda Boulevard, north and south of Rayen Street. More details at Reseda Blvd blog. Connect the Dots – on Van Nuys Boulevard in Van Nuys – hosted by the Arid Lands Institute with CD6, Pacoima Beautiful, the L.A. County Bicycle Coalition, and Emerging Terrain Architects. Enjoy a family-friendly bike ride (12:30 p.m.), bike rodeo (2 to 4 p.m.), community design workshops, and a block party (6 to 9 p.m.) taking place at the San Fernando Valley City Hall on Van Nuys Boulevard between Sylvan Street and Erwin Street. More details at Arid Lands Institute. Street Beats – on Crenshaw Boulevard in Hyde Park – hosted by TRUST South L.A. with CD8, Community Health Councils, Ride-On Bike Co-Op, SCOPE, and Studio MMD. Join a one-day music-oriented festival at the intersection of Crenshaw Boulevard and Florence Avenue. Neighbors, DJs, dancers, and musicians will be creating music together. RSVP and share via Facebook event. Youth Envisioned Streets – YES! For a Healthier South L.A. – on Central Avenue in South L.A. – hosted by the National Health Foundation with L.A. Walks, L.A. County Bicycle Coalition, the Coalition for Responsible Community Development, and A Place Called Home. YES will “engage young people in the planning process, collecting input from community members about the physical environment, and then building their dream world for a day.” The demonstration will take place from 7 a.m. to 4 p.m. on Central Avenue from 33rd Street to Martin Luther King Jr. Boulevard. RSVP and share via Facebook event. Pacoima Street Values – on N. Van Nuys Boulevard in Pacoima – hosted by Pacoima Beautiful with CD7, LA-Más, CicLAvia, and the Urban Land Institute L.A.
During the North SFV CicLAvia – The Valley, share your ideas and help shape the way the city can improve Van Nuys Boulevard in Pacoima – identify, encourage, and enhance positive activities that are already taking place – un-permitted and permitted. More details soon at Pacoima Beautiful. Nuestra Avenida – on Cesar Chavez Avenue in Boyle Heights – hosted by Multicultural Communities for Mobility and KOA, REI, CALO YouthBuild, and SCAG. Details coming soon – check the MCM website for information. FIG JAM – on North Figueroa Street in Highland Park – hosted by the North Figueroa Association with CD1, Gensler, Occidental College, CALO YouthBuild, Claremont College, Stones Throw, Teatro Arroyo, L.A. Walks, and Future Studio. Fig Jam will be a free day-long festival on North Figueroa. Details to be posted at Fig Jam site soon. Mayor Garcetti recently announced a new $200,000 Arts Activation Fund grant program that partners the Great Streets Initiative and the Los Angeles Department of Cultural Affairs (DCA). Applications are available now and accepted on a rolling basis, with no final deadline set. The projects can take the form of temporary objects, installations, or experiences that are free to the community and situated in public places or within public view. Individual artists, collectives, limited partnerships, nonprofit organizations, and commercial businesses across the City are all eligible to apply. Go to the Arts Activation Fund website for more information and to apply.